Two teams who have never played at the IceBox in Lincoln will take on the Stars this weekend as the two new USHL expansion teams visit on Friday and Saturday. The Stars will host the Bloomington Thunder on Friday, and then the Madison Capitols on Saturday. The Stars enter this weekend riding a two-game losing streak after winning two in a row before that. Lincoln is in last place in the USHL western conference with a record of 8-13-4 (20 points). Click here to view the current league standings. Lincoln's first opponent this weekend, the Bloomington Thunder, are tied for seventh place in the USHL eastern conference with a record of 11-12-4 (26 points). The Thunder are 4-7-2 in 13 road games so far this season. Madison is 1-2-1 in their last four games played. This will be the first of two meetings between the Stars and the Thunder during the 2014-15 regular season. The Thunder will be back at the IceBox in Lincoln on February 7th to finish out the two-game season series. The Stars will not travel to Bloomington, IL this season to battle the Thunder. 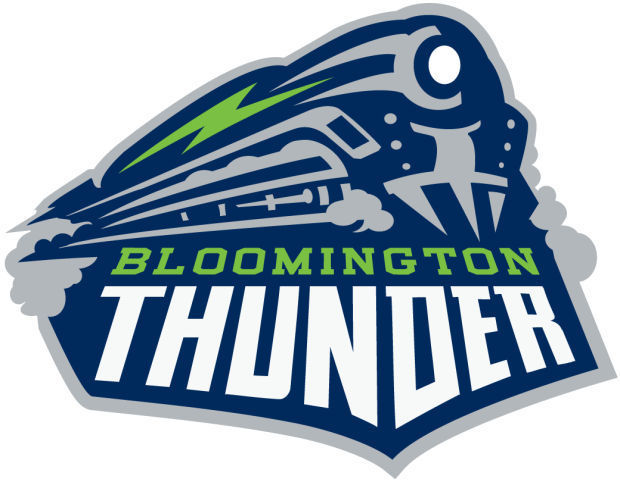 The expansion Bloomington Thunder were welcomed into the USHL on April 9th, 2014. Before they were awarded an expansion franchise by the USHL, the Thunder were previously a SPHL (minor pro) hockey team before the club suspended operations this past March. The new owners kept the Thunder name and brought junior hockey to the hockey fans in Bloomington, IL. Much like the Stars, the Thunder have struggled to score goals this season. They are averaging 2.78 goals per game, which is the third worst in the USHL. Conversly, Lincoln is averaging 2.76 goals per game, which is second worst in the USHL. Bloomington's leading scorer is actually a defenseman (Vince Pedrie with 18 points in 27 games). Lincoln's second opponent this weekend will be the Madison Capitols, who sport a record of 14-9-4 (32 points) and are in fifth place in the USHL eastern conference. The Caps are 6-4-3 in 13 road games so far this season. Madison is 4-1-0 in their last five games played, including back-to-back wins against the top team in the USHL, the Cedar Rapids Roughriders. This also will be the first of two meetings between the Stars and the Capitols this season. Lincoln will travel to Madison, WI on Wednesday, January 21st to take on the Caps to finish out their regular season series. 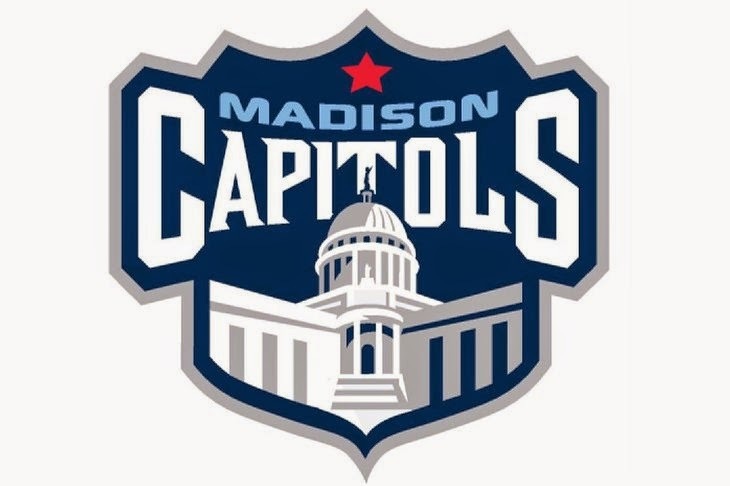 The expansion Madison Capitols were welcomed into the USHL on November 26th, 2013. Unlike the Thunder, the Caps have prior history in the USHL, as they existed as the Madison Capitols from 1984-1991 and then as the Wisconsin Capitols from 1991-1995 before the franchise went defunct. So the first-generation USHL Capitols never faced the Lincoln Stars who joined the USHL in the fall of 1996. Despite being an expansion team, the Capitols have really surprised a lot of people with their play so far this season. As I mentioned above, they beat the Cedar Rapids Roughriders in back-to-back games this past month, which is no easy task. They are led on offense by forward Will Johnson, who is the USHL's fifth leading scorer with 32 points in 27 games played. One player on the Caps' roster who should be familiar to most Lincoln fans is defenseman Daniel Willett. Willett, who played a total of 67 games for the Stars over two seasons, was originally traded from Lincoln to Muskegon last season. After playing only 7 games for Muskegon this season, Willett was traded to Madison where he has seemed to finally found his place. In 20 games for the Caps, Willett is Madison's top scoring defenseman with 12 points (4g, 8a). Lincoln's offense has really been stagnant as of late, scoring a total of only 14 goals in their last seven games played, and seven of those fourteen goals game in one game against Sioux City. Let's hope a return to the comfy confines of the IceBox will breathe some life back into the Lincoln offense. I'm really looking forward to this weekend, mainly because of the two new teams. Nice to see the eastern conference teams visit the IceBox. You can't beat a full weekend of hockey at the IceBox, also. Edit: A reminder that the Stars hosting a "AAA Day at the IceBox" on Saturday, January 3rd. Click here to read more about that. I'll include the flyer the Stars posted on their social media accounts below. 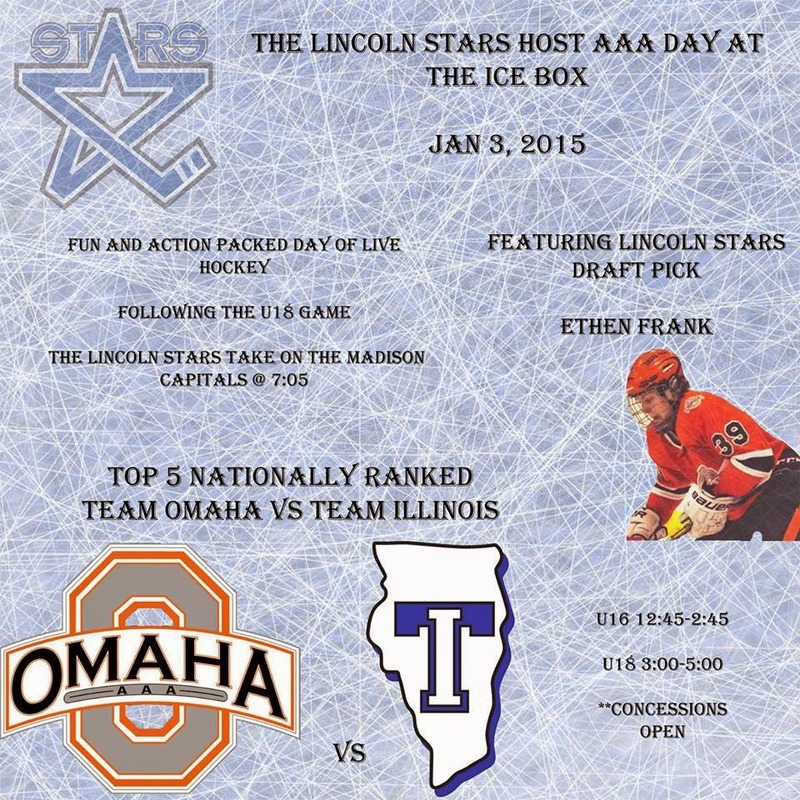 I'm planning on attending the early Omaha AAA U16 game in order to watch Stars affiliate forward Ethen Frank. Frank plays for the U16 team, so if you want to see him in action, show up at the IceBox at 12:45pm. Frank was recently called up by Lincoln for one game, which was a 7-5 Stars win on 12/19/14 against the Sioux City Musketeers. Frank picked up two assists in his first USHL game.